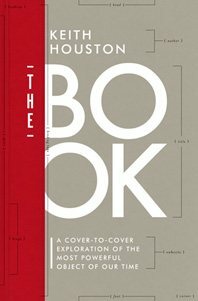 For those of us who love history, especially as delivered in books, Keith Houston’s latest volume is catnip: a history of books (more specifically, a history of book production) called The Book. Not an easy title for search engines, but the subtitle says it all: A Cover-to-Cover Exploration of the Most Powerful Object of Our Time. Houston’s chapter titles reveal his puckish sense of humor, e.g., “The Prints and the Pauper: Johannes Gutenberg and the invention of movable type.” The Book is punctuated with delightful old woodcuts, archival illustrations, and gossipy stories about book-related figures ranging from the Egyptian vizier Ptahhotep to St. Patrick (who knew?). Houston takes his subject seriously but not ponderously. Like all book people, he loves “the bookness of all these books, the weighty, complicated, inviting artifacts that humanity has been writing, printing, and binding for than fifteen hundred years.” Extra credit for mentioning the phrase “coffee-table tome” in the third sentence, though it doesn’t arise again. I would have liked a graphic timeline and more coverage of contemporary illustrated books (e.g., books published by Taschen), which I believe will be the print volume genre that endures the longest.